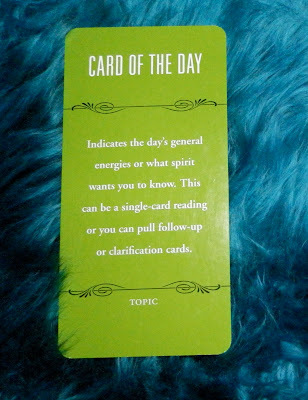 But this discussion of the COTD got people talking on Aeclectic.net and both FallynRaiyn and Ladyoflosttimes said they use it in their spreads to represent "today" or "now"—how the reading/topic/issue affects the day ahead or what you should do about the issue today—whatever you need to get out of it TODAY! Woo hoo! My COTD has relevance beside being a marker for someone's COTD draw! It had never occurred to me to use that position like that, but it makes perfect sense. So the next time you see your green COTD card, give it its props!